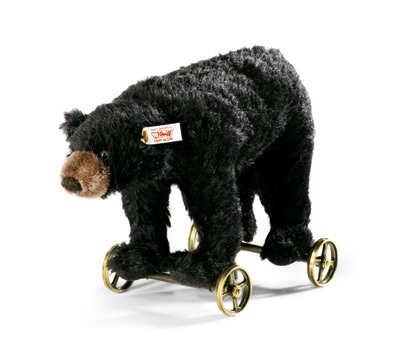 Steiff Black Bear on Wheels Discounts Apply ! Made from The Finest Black Mohair. We introduced the first animals on wheels in 1892 and they've never gone out of style. Grown-up children still enjoy our wheeled wonders, with many people building dedicated collections of these Steiff novelties. Whether this will be your first - or one of many - you'll want to be sure to order our Black bear on wheels. There's never been another one like it. Our black bear features all the Steiff trademarks that our collectors appreciate: the mohair coat, the airbrushed details, and the hand-stitched nose and mouth. He rolls along on cast iron wheels forged in the distinctive Steiff style. And although the concept is now nearly 125 years old, you'll discover that no collection is quite complete without a Steiff animal on wheels. with Safety Eyes and stuffed with Safety Filling, and with gold-plated "Button in Ear" with elephant motif and Surface Washable.